We offer second sheets, blank sheets that are the exact same paper stock and weight as our printed letterhead, for use in multiple-page letters and documents. When Will I Get My Letterhead? 500 to 5,000 Letterhead: Ships or ready for pick up in 2 business days from proof approval. Under 500 Letterhead (printed digitally): Ships or ready for pick up in 1 business day from proof approval. Over 5,000 Letterhead: Ships or ready for pick up in 5 business days from proof approval. Create a long-lasting favorable impression with customers and prospects when you use letterhead printed by 48HourPrint.com. Our high quality letterhead printing gives your organization a truly professional look -- whether you’re a start-up company or have been in business for decades. And you get more for your money with our affordable letterhead printing prices. 48HourPrint.com’s online letterhead printing services also give you the benefit of our industry-leading 48 Hour Turnaround Guarantee for quantities up to 5,000 printed letterhead sheets and our 24 Hour Turnaround Guarantee for quantities fewer than 500 letterhead sheets printed on our digital press. Well-designed and eye-catching letterhead positively shapes people’s attitudes about your company. So does high quality letterhead printing. The full-color letterhead printing of 48HourPrint.com will help present your company favorably, every time you send a letter. Complete your organization’s identity package by also ordering our full-color business cards and envelopes. High quality letterhead printing -- and business card and envelope printing -- is critical to projecting a successful image for your organization. Our full-color letterhead printing is printed on 70# opaque text, laser and inkjet printer-compatible paper stock. 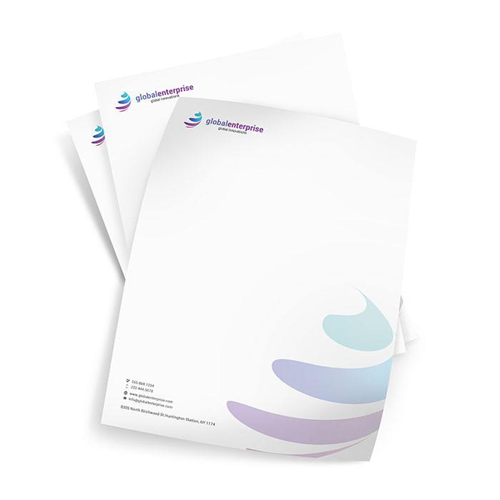 Check out our letterhead marketing ideas for more letterhead promotional tips. Also review our letterhead templates for layout guidelines that will help keep your print job on schedule.